Forex Grid MT4 Expert Advisor "ELDORADO"
Forex Grid Expert Advisor "ELDORADO"
How does the Forex Grid "Eldorado" Expert Advisor work? Forex Expert Advisor "Eldorado" based on FOREX Grid Strategy. Forex Grid Strategies designed to reduce risk by making the success of a trade independent of the direction the market moves. Expert Advisors based on FOREX Grid strategies can be an effective approach provided the currency traded is not in a strong upward or downward trend (in which case Forex grid trading will not work well). Grid trading is a difficult strategy, and requires a degree of expertise. 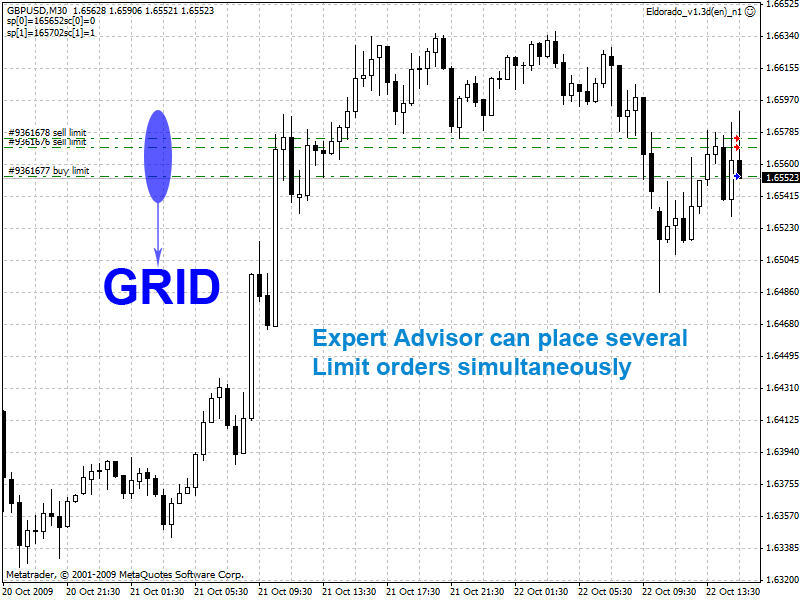 However, it's easy to understand the basic idea of how to grid trade FOREX. Sell order makes profit when the exchange rate falls and a buy order makes profit when the exchange rate rises.